Have you ever said something to a girl that seems to instantly set them off? One second everything was fine and the next she’s screaming like some sort of atomic bomb of rage. Let’s face it, there are certain phrases that you just shouldn’t say to girls. Like, ever. Man-speak: You’re really jazzed up about this, what’s going on? Women World: You literally have the worst attitude right now. Check yourself. Man-speak: Is this the final outfit, can we finally leave now? Women World: You just spent hours in there and this is the best you can do? Or you look ugly. Please change so I don’t have to be seen with you. 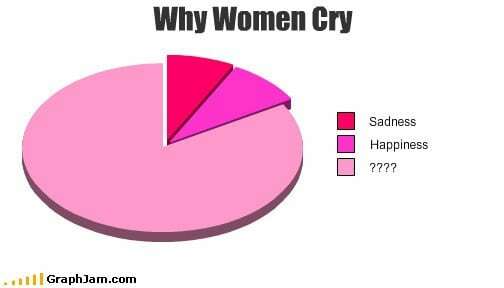 Women World: You’re an emotional wreck and being super emotional right now. I can’t deal with it, get your sh*t together crazy lady. Man-speak: Did you get a lot of sleep last night? Women World: Why did you even get out of bed today? You’re like a mix of a monster and a zombie. Did you even try today or was that too hard to handle? Your dark circles are literally offensive to my eyes. Man-speak: I’m just trying to be supportive right now. Cheer up, buttercup. Women World: You’re incomplete without a man. Even though you have family, friends, health, are doing well in school, working, and doing extracurricular activities your life is in shambles because you’re lonely. Like really lonely, obviously, because you don’t have a man. Did I mention you’re single? Maybe there’s something wrong with you. Man-speak: You just did a total 180 from happy to mad, now you’re crying and stuffing food down your throat, now you’re yelling at me with food in your mouth– what the heck is happening?! Women World: Stop expressing your opinions right now. You’re so disgusting and emotional right now you must have some sort of biological reason for acting so crazy. You’re like some sort of monster-person. Why do you keep eating you’re getting so fat? Put the Oreos down girl….just step away, your figure doesn’t need it. PS- This is the number one thing you should NEVER say to a girl, we have enough to deal with if it is that time of the month. We probably don’t even want to be dealing with people in the first place, so if we’re acting crazy don’t comment on it. Just don’t. Because, trust us, we don’t want to deal with it either. Thanks genetics. Plus, if we aren’t then it’s mega insulting that you think we’re acting crazy because of the cooties coursing through our veins. Sometimes it really does seem like men are from Mars and women are from Venus, but if you wipe these phrases from your vocabulary we might be able to prevent an intergalactic war of worlds. Is there another phrase that drives you crazy ladies? Let us know in the comments below!